In the previous article, we were discussing the evolution of landforms due to the activities of running water and groundwater. This article deals with the evolution of landforms due to another exogenic geomorphic agent – glaciers. Glaciers are a mass of ice moving under its own weight. They are commonly found in the snow-fields. We know that the landmass on the earth is not entirely the same as we see around. Some areas are covered by thick green forests, some with dry hot deserts, some with permanent ice covers etc. Among these varied landmasses, the permanently ice-covered regions on the earth surface are called as snow-fields. 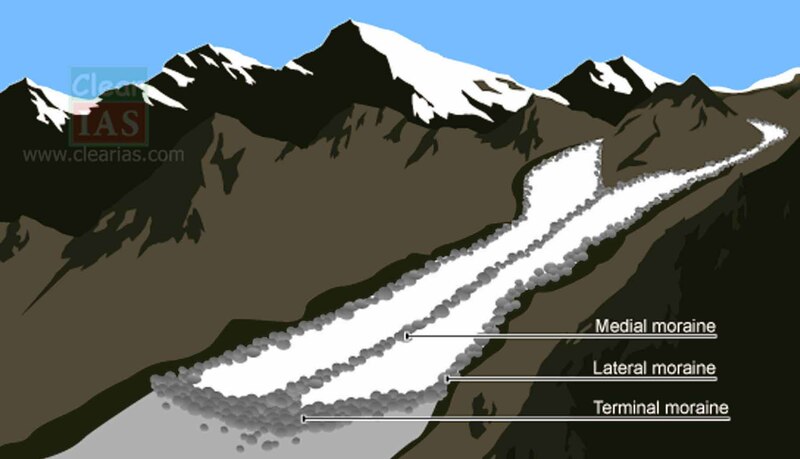 The lowest limit of permanent snow or snow-field is called as the snowline. A Glacier forms in areas where the accumulation of snow exceeds its ablation (melting and sublimation) over many years, often centuries. They form features like crevasses, seracs etc. A crevasse is a deep crack, or fracture, found in an ice sheet or glacier, as opposed to a crevice that forms in rock. A serac is a block or column of glacial ice, often formed by intersecting crevasses on a glacier. Ogives are alternating wave crests and valleys (troughs) that appear as dark and light bands of ice on glacier surfaces. They are linked to seasonal motion of glaciers; the width of one dark and one light band generally equals the annual movement of the glacier. Glaciers cover about 10 percent of Earth’s land surface and they are the largest freshwater reservoirs on earth. They are deep, long and wide troughs or basins with very steep concave to vertically dropping high walls at its head as well as sides. They are simply a bowl-shaped depression formed due to the erosional activity of glaciers. When these depressions are filled with water, they are called as Cirque lake or Corrie Lake or Tarn Lakes. The Glacier doesn’t create a new valley like a river does but deepens and widens a pre-existing valley by smoothening away the irregularities. These valleys, which are formed by the glacial erosions assume the shape of letter ‘U’ and hence are called as U-shaped Valleys or Hanging Valleys. A fjord is a very deep glacial trough filled with sea water and making up shorelines. A fjord is formed when a glacier cuts a U-shaped valley by ice segregation and abrasion of the surrounding bedrock and this valley gradually gets filled with the seawater (formed in mountains nearby sea). 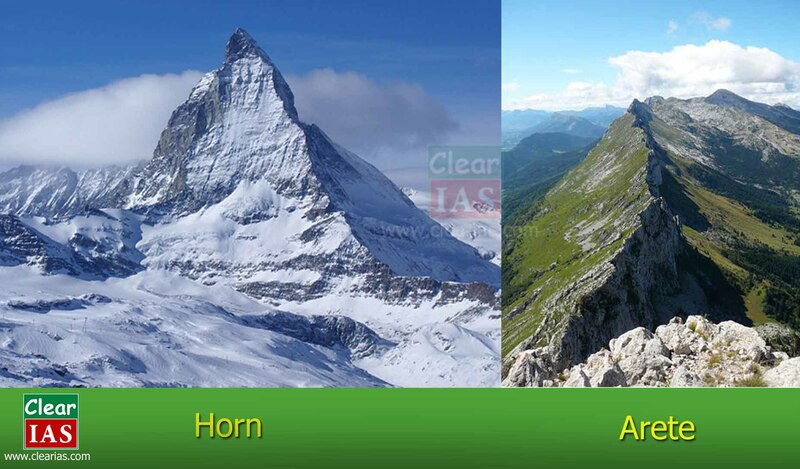 Horns are sharp pointed and steep-sided peaks. They are formed by headward erosion of cirque wall. When the divide between two cirque walls gets narrow because of progressive erosions, it results in the formation of a saw-toothed ridge called Arete. (ii) Outwash – assorted roughly stratified deposits. Moraines are long ridges of deposits of glacial till. When these deposits are at the end of a glacier, they are called as Terminal moraines and when they are deposited on both sides, they are called as Lateral moraines. When lateral moraines of two glaciers join together, they form Medial moraines. When the lateral moraines of both sides of a glacier join together, it forms a horse-shoe shape. Ground moraines are deposits left behind in areas once covered by glaciers. When glaciers melt in summer, the water which formed as a result of melting accumulates beneath the glacier and flows like streams in channels beneath that ice. Very coarse material like boulders, blocks and some minor fractions of rock debris are carried away by these streams. They later get deposited in the valleys itself and once the ice melts completely, they are visible to the surface as sinuous ridges. 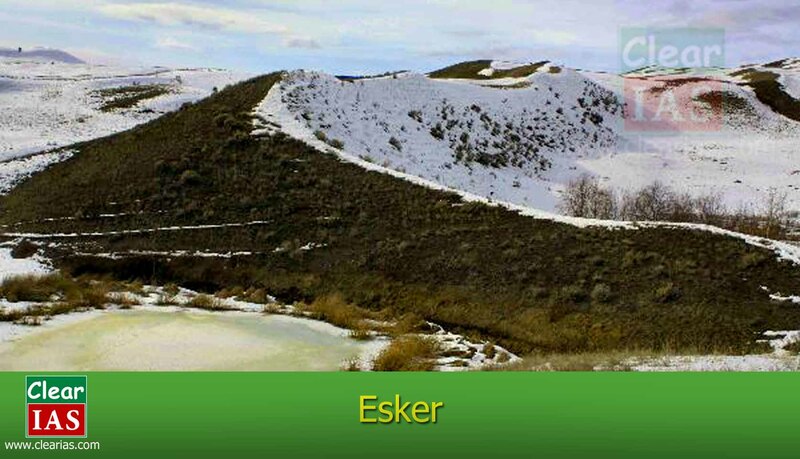 These ridges are called as Eskers. They are smooth oval-shaped ridge-like structures composed mainly of glacial till. It shapes like an inverted spoon with the highest part is called as Stoss End and the lowest narrow part is called as Tail End. They are formed as a result of glacial movement over some minor obstruction like small surface rocks. The glacial till gets deposited in those obstructions and the movement of glacier shapes these deposits like an inverted spoon. Next in the series: Evolution of landforms due to wind and waves. u all of team r doing great work & boon for those candidate who haven’t joined any coaching center. thank u all of clearias team . Thank you very much… it’s greatly helpful to students..
i dont have enough words to praise clearias team for doing such a great work. this is very helpful for a student like me where i cant afford for coaching. thank you so much and may god bless all of you..
Due to lack of Internet I am giving my view short .. This is so informing I came to know about New thing and words related to Erosion and Deposition and Action of Glaciers some words were so new for me.